I reached for The Affair recently during a sticky phase of writing. I needed something straightforward and familiar and I thought Reacher would fill that role perfectly. I’ve read one of these books before and enjoyed the military precision with which they are written. 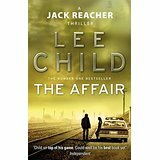 The Affair is a prequel, set six months before the events in Killing Floor (the first in the series.) Major Jack Reacher of the US Military Police goes undercover in Mississippi, to investigate a murder. A woman has had her throat cut and just down the road is a big army base. Is the murderer a local guy, or is he a soldier? The sheriff is a woman and her investigation is going nowhere, although it isn’t clear whether her efforts are being blocked or if she is not that keen on finding out who the killer is. I like Reacher, his CV is at the front of the book but I don’t understand why he doesn’t have a driving licence preferring instead to hitchhike his way to anywhere. Maybe this is covered in one of the stories I don’t know however it doesn’t stop him driving whenever he has a need to, like in this book. He also seems very capable in every other area of his life so it’s a mystery. Anyway, this story is told from Reacher’s point of view and I really like how methodical he is, the no nonsense way he goes about his investigation, the frequent brutality and the little touches of humour throughout. He appears emotionless, and even though this book is called The Affair that doesn’t seem to change this state. He also engenders deep respect and loyalty among those he has worked with before and is not so isolated in his work that he doesn’t use these connections when appropriate. It took me a couple of chapters to get into the story and there are a one or two moments when my belief was definitely tested but Reacher does what he does and you just go with it. There are so many books in this series I’m not even sure what number they are now up to but for those who love tough independently minded and slightly maverick heroes in their thrillers this is a great series to get into. Every Jack Reacher story I’ve ever read has been a cracker. They are formulaic but each story has a different setting and are meticulously researched. This difference within a familiar framework makes each book a great read, and Lee Child manages to pull a surprise ending every time. Martyn is working his way through them. He loves them! Says Childs creates real characters, as well as fast paced adventures. Yes, they are formulaic, but well written. Georgia, great review. I haven’t read this one. In one of the ones I have read, it was mentioned that not having a driving licence is part of his desire to keep off the government grid. Thanks Gordon, it’s lovely to see you here. I knew someone out there would be able to shed some light on the driving licence conundrum 🙂 I appreciate the input and thank you for commenting.